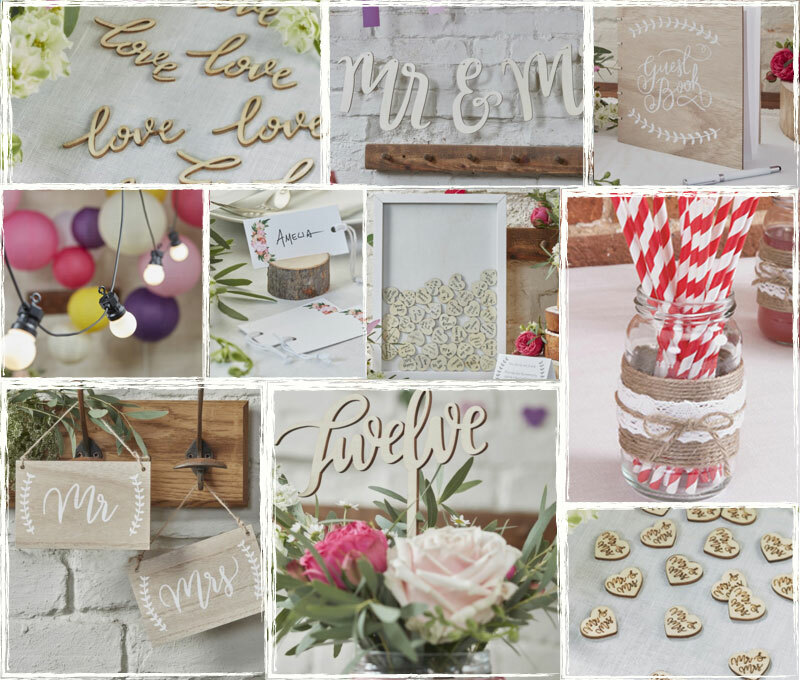 New Rustic, Vintage & Rose Gold Product Ranges! If you have been hiding under a rock for the past few months or haven’t discovered the ever inspiring world of Pinterest yet, then you may not be aware of the Rustic Boho craze that this new range portrays perfectly! Two of our favourite products in this range are the wooden traditional guest book and the wooden heart piece drop top guest book. Sometimes, it can get tricky trying to find a way of keeping your theme persistent throughout your special day. With the help of decorations such as buntings, table numbers and paper straws this worry can be left behind. A big fancy centrepiece isn’t always needed and small affordable decorations can emphasise the theme you’re going for perfectly. Paper straws are a fab way of adding a pop of colour; they truly are a simple and easy way to punch up the fun factor and allow your guests to sip in style. Another great way of enhancing your theme and bringing your reception to life is table confetti. The glamorous timeless colour of Rose Gold is becoming a favourite in the world of weddings. If you’re looking for a fresh way to glitz up your special day then this colour duo along with some sophisticated shiny sparkling metallics really is perfect. Buntings are a great way of decorating your venue, whether they’re hung above the buffet or simply scattered around the venue. 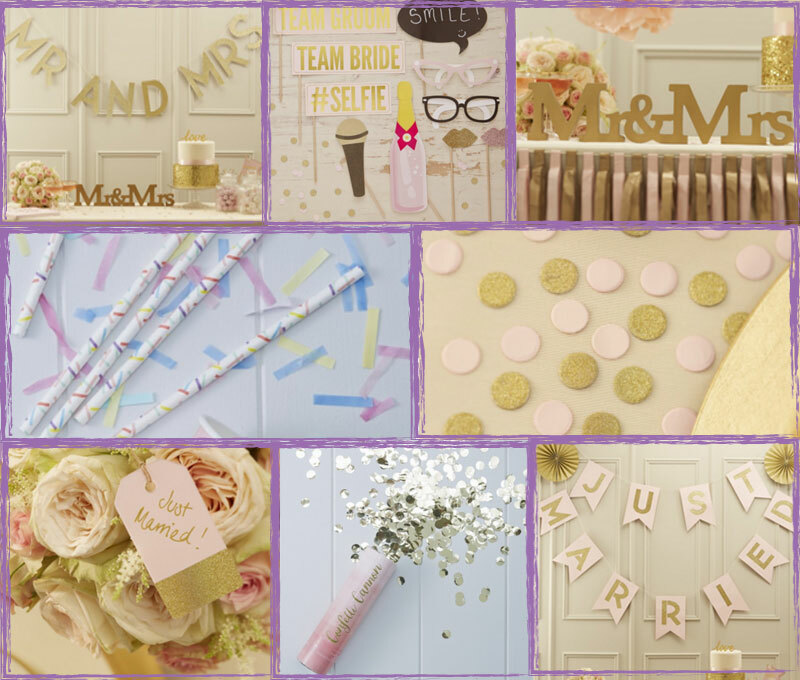 A great way of creating the party vibe is with an exciting photo booth kit. Whether you have hired a photo booth or you just want to take snaps on your phone. These fun props are bound to get the party started and create some memories. One of the most loved wedding themes of all time is Vintage. 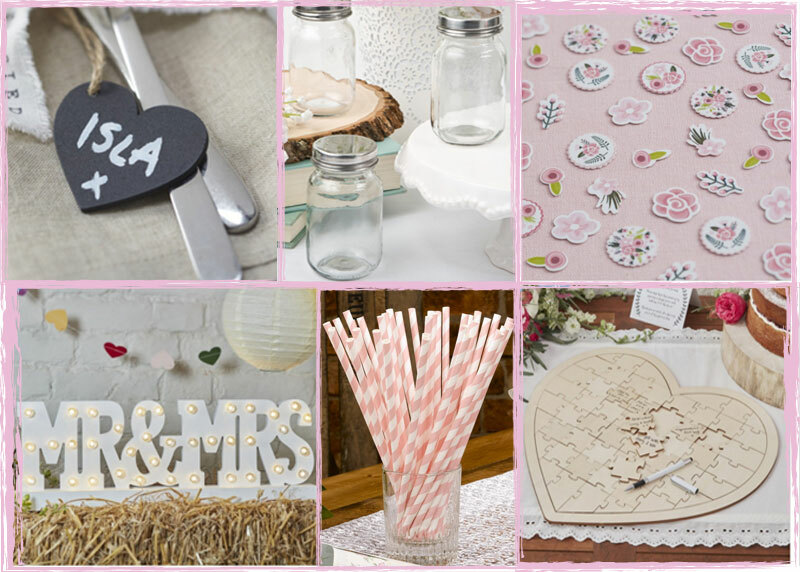 Whether you’re thinking Shabby Chic or Great Gatsby, this new product range is bound to make your wedding flawless. Mason jars and Pinterest seem to go hand in hand and their friendship has taken the Internet by storm. Mason jars are hugely popular at the moment. Whether they are used as centrepieces, favour jars, vases, cups, or fairy light holders the list is virtually endless! When the deal is sealed and you’ve become Mr & Mrs you’ll want to show your new title off until your heart’s content, and what better way to do this than by this Mr & Mrs light up sign! It’s stylish sleek design really will catch your guests eyes.